I'm happy to announce the second annual of the Wet Plate Competition was a great success! There were over 220 submissions from 90 artists in 19 different countries! After nearly a month of difficult deliberation from our judges, we're excited to present the winners of this year's competition. We hope you'll also spend time reading each artist's story, and visit their websites to see more of their work. I first became interested in collodion after seeing the work of Sally Mann in a photo book several years ago. I found the photographs moving and the process itself rather compelling. In 2013, I attended a workshop at the George Eastman Museum to study under Mark Osterman and learn the wet plate process. I’ve been practicing ever since. Two Nails is an attempt to share something of my own experience with the world. It comes from an ongoing body of work titled The Framer. I’ve been working professionally as a picture framer for nearly a decade now, and it seemed like a natural extension of my working life to begin photographing the tools of the trade. With this ambrotype, I wanted to make a self-portrait that sought beauty in its simplicity. Making the plate itself was a real labor of love. I say this, in part, because it took two months to work through. How does one make nails float? The answer, it turns out, is a lot of hard work. Through the use of selective focus, lighting, perspective, and a bit of custom fabrication, I was able to achieve the illusion. For me, the process was all about trial and error. I’ve discovered you learn a lot in the trying. To be featured as a grand prize winner among so many hard-working artists is a real honor. I would like to thank the judges and sponsors; your support is immeasurably valuable and very much appreciated. Thank you! I have always lived in big cities, now I live in a tiny medieval village surrounded by nature. My approach to photography, through wet plate collodion process, reflects the slowness of the place where I live. I also really like portraiture, the result of a tension between me and the subjects in front of me that results in a unique image. This plate (10x12 inch) is part of a series called “Gestation” consisting of four collodion plates on clear glass. Each plate is the result of a double exposure: one image of the silhouette of my pregnant wife, obtained through a backward illumination of the subject with continuous light; and another one of the grain I placed on a black background. The idea come up during the period of my wife's pregnancy and was created two days before my daughter Giorgia’s birth . Seeing the transformation that my wife had during her pregnancy time was an incredible experience. Day after day her body has become more and more beautiful and strong in order to protect the life she was carrying on. Being rewarded by an international photography jury is a great incentive for me to keep moving in this direction and doing experiments with this wonderful timeless photographic technique. This photo is the result of a three days long preparation and negotiation. The photo shooting took place in one of Hungary’s most beautiful castles, the Esterhazy palace. Because it is a scheduled monument we needed a lot of permits. With the figure of the ballet dancer I did not want to point out the dance but rather to emphasize the tension surrounding the dance itself, its edges and lines. I think your initiative with this photo contest is very inspiring because one can get to know fantastic photographers and their amazing works. Someone who tries to take this kind of photo at least once in their life starts to observe our busy world in a different way and is able to slow it down. Stephen Robinson and Libby Bulloff are Seattle WA artists, working together as Henrietta’s Eye. 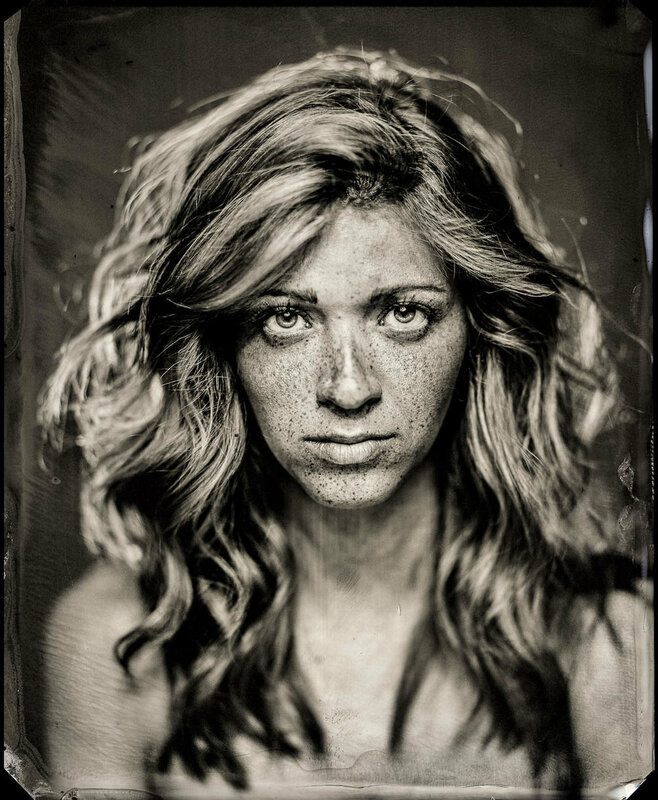 We are primarily self-taught having been introduced to wet plate collodion almost by accident when a friend showed us the basics of the process. Admittedly, there’s more than a little bit of punk rock, DIY attitude in us, so making photographs the hard way somehow naturally meant for us that we’d also learn the hard way. About our piece, fully titled Incroyable! (Wednesday, November 9, 2016): intentionally referencing the surrealist painter Magritte, it's our attempt at expressing the collective spasm of disbelief felt by many following the 2016 presidential election in the United States — not just the surreal nature of that moment but the outrageous nature of life since. Beyond the symbology of the carnation, the suit and tie and mushroom cloud-like explosion, it was thematically relevant to use the in-camera trick photography associated with the early 1900s spiritualist movement to express this communal gasp and the experience of being hoodwinked by charlatans. We’re extremely grateful for being recognized for our work and humbled that it was chosen from among such good company. Last October someone broke into the shared place I use for a studio and stole nearly all my large format cameras and a very rare and big lens I got borrowed from a friend for ultra large format portraits. Gathering equipment for wetplate always means searching auction houses and hoping to be lucky. Since I started wetplate about four years ago I therefore tried to get good equipment to work - that then was gone. When I had overcome the first shock I packed the last ‚portable‘ wooden camera and all my darkroom equipment and drove into the Spreewald near Berlin to escape the studio and all the bad thoughts. At this small lake in the woods I set up the camera from 1890 together with an old wide angle lens from 1880 and exposed one plate around 60 seconds. One should always keep on doing what you love! Feeling frustrated with the meaninglessness of most digital photography in combination with a desire to make something with my hands, I found the wet collodion process. In February of 2013 I took a class taught by Quinn Jacobson and thereafter we became good friends. 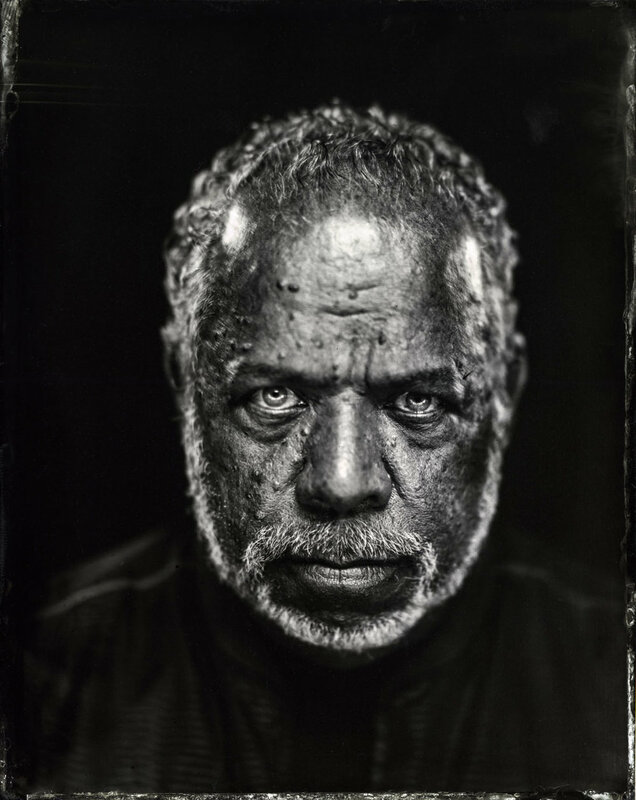 I related to Quinn’s philosophy that the collodion process should be used to create something meaningful; he took me under his wing and he became my mentor. While apprenticing at Quinn's studio in Denver, I invited my close friend and skateboarder, Walter Lacey, over to show him the process and take his portrait. The plate “Waltnessmonsta” was one of the earliest images I made for the LIFERS project series. This shot was made using a 11x14 Deerdorff studio camera with a 320mm CC Harrison petzval lens. The image is on black glass. I originally studied printmaking at RMIT University in Melbourne, Australia from 2009-12 before transitioning to photography. I worked digitally for five years until I grew tired of working in front of a screen and decided to enroll in a tintype/ambrotype workshop at Gold Street Studios in Trentham. I am inspired by a mixture of artists, writers, films and TV shows, and have a large hard drive full of media collected over 10 years. The artists whose work I regularly revisit include Berlinde de Bruyckere, Jenny Saville, Lauren Simonutti, and Sally Mann. I am drawn in by the rawness of their work, and the treatment of the human body in their respective practices. For the past few years I have been working on a series centred around anxiety, and the body’s physical and emotional responses to persistent overthinking. I incorporate props such as thread, clothing, plastic wrap, and glass vessels into my photographs to restrict and compress the flesh, and recreate the daily feelings of anxiety I experience. In “Gravity”, I wanted the body to be suffocated in a glass and water cage. It is a great pleasure for me that two of my photos have been rewarded. My photo was born from the idea that the egg as the origin of our world - the birth - has already been set on its edge and has to balance on it. And the scissors as the sword of Damocles are swaying above the egg. The rope can break any time and they can smash into the fragile eggshell. I started doing wet plate collodion two years ago and glassblowing shortly thereafter. I stumbled through being self-taught with wet plate in the beginning but wanted to learn more about the process. I took a wet plate collodion class taught by Dan Estabrook at Penland School of Crafts in the summer of 2018 and returned again as a studio assistant for Jill Enfield in the spring of 2019. These opportunities allowed me to refine and continue printing on my blown glass forms. I strive to find a balance between two and three-dimensional planes within my art. I blow the glass vessels to create an extension beyond the photograph that is just as important as the image itself. I use positives in contact with the wet plate emulsion under an enlarger to expose the images onto the three-dimensional glass forms. Next, I develop, and varnish before removing the frame from the glass. The idea behind the forms was my constant search for belonging and a place to call home. I always knew that the Midwest wasn’t the place for me, so I started travelling around the world looking for my idea of a home. Home is more than just a place, it’s about finding the right person, community and artifacts to make a place your home. The image printed on this glass vessel was taken in Ebeltoft, Denmark.